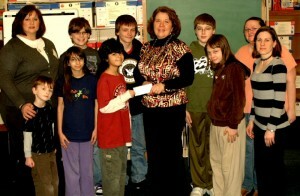 The Red Cross Club at Fitzhugh Park Elementary School presents donation. OSWEGO, NY – The Red Cross Club at Fitzhugh Park Elementary School raised nearly $200 for the Red Cross during a recent sale of candy grams. Karen Ferguson from the Red Cross receiveda check from FPS student Jordan Delgado. Gathering for the celebration are (in front left to right) Alex Loomis, April Howard, Delgado, Ferguson, Latosha Pitcher and advisor Carrie Ackerman. In back are Kathy Pecora, Nate Sananker, Brett Collins, Matthew Weller and Amelia Loomis.